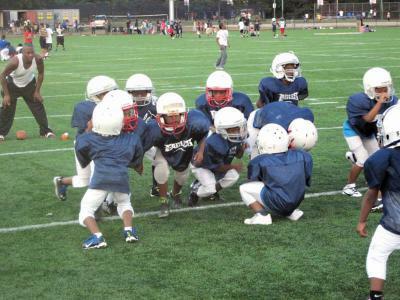 The Dorchester Eagles Pop Warner league will host the Mayor’s Cup Football Jamboree this weekend at the newly renovated Roberts Playground near Codman Square. Youth football players from all over Boston will participate in the all-day event on Sunday, which will feature live performances, food and, of course, football. Over 1,000 people are expected to drop by the day long event, which will also serve as a way to highlight the results of a $2.8 million renovation project to the playground— which now serves as the Dorchester program’s home field. The renovations to Roberts Playground on Playstead Road were completed in August 2013. Over 200,000 square feet of Astroturf was installed creating four specific fields— two for baseball/softball, one for soccer and one for football. Stadium-style lighting has been installed as well as new, accessible bleachers and stationery work-out equipment. The improvements were funded from the city’s capital budget. In the past the Dorchester Eagles have had to practice at Town Field or other fields and parks in the neighborhood. The renovated field provides a proper training ground and a sense of security. Stacey Marlow, 41, from Mattapan remarked on the change the renovations have caused as she watched her six year old son Tyron participate in Eagles practice. Anthony Taitt has lived nearby for about ten years. He brought his ten year-old son to his first season with the Eagles. Taitt noticed similar changes associated without the parks improvement.